Sooo…it could just be that I’ve been reading Bizarro fiction as of late, but I’ve been wanting to circle back to the insanity and freedom of writing that was The Lost Pages of Trevor Sunburn. When I had written that novel, I just came out of finishing a novel for young adults (or perhaps I should say ALL audiences, as it was written with older adults in mind as well) so naturally I’d wanted to lash out without restraint when I got my fingers back on the keyboard again. I’d been reading a lot of Burroughs around that time as well, so I’m sure that leeched into the manuscript in more than one instance. The result was the fastest and most fun novel I’d ever written that contained, as one friend put it, “a lot of fluids.” Whether it was a massive carpet covering the city made from stitched together humans, or an elevator to space, no matter how outlandish it seemed, it made its way into the final manuscript and it worked (or so I’d like to believe). 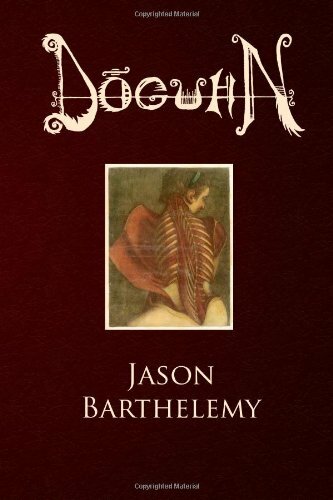 I like to mix things up and so my first novel, Doguhn, was a horror/fantasy heavily inspired by Clive Barker (Imajica being the reason I started writing in the first place). The Lost Pages of Trevor Sunburn came second and was a horror/sci-fi/action/dark comedy/surreal post-apocalyptic adventure. After that is The Skin Collection, an undiluted straight-up horror novel to be released early next year (sorry about the slight delay, but this is happening the in the first quarter this time…I swear!). In between Doguhn and Trevor Sunburn was Web Country, which is complete but in need of some minor polish, and is the aforementioned fantasy/horror for young (and old) adults; which will hopefully be released not too long after The Skin Collection. I’ve since begun work on three new novels and have posted samples here in the past. My current focus is a sequel to Doguhn to be titled, The Eanigmus, though as I’ve stated, I’ll soon circle back to What Lurks Beyond the Shadow City? to satisfy a bit of that experimental bizarre fiction I’ve been itching to get back to. True, I’ve been a little all over the place and been hitting far too many roadblocks and distractions, but life happens and sometimes needs to be reeled back in. Rest assured that no matter what comes next, there’s plenty of content on the way that I’m excited to share and I’m hoping you’ll have fun experiencing. Stay tuned and as always, thanks for reading! This entry was posted on Sunday, December 4th, 2016 at 1:12 PM	and tagged with books, doguhn, fiction, horror, inspiration, novel, sci-fi, The Skin Collection, trevor sunburn, writing and posted in Dreaditorials. You can follow any responses to this entry through the RSS 2.0 feed. « The Skin Collection is coming soon!